Experience the magic of camping! Camp under a star-filled sky, roast marshmallows over a campfire and enjoy our accessible campground at the foot of majestic James Peak. Camping is free, but a reservation is required with the NSCD for the Jim Creek Campground. Permit area is located in the Arapaho-Roosevelt National Forest. 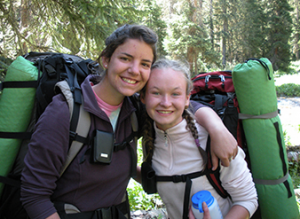 If you wish to receive assistance during your camping experience, hosted camping is for you! We will set up camp, prepare meals and clean up. Space is limited and on a first-come, first-served basis. Rental equipment is available. Participants must be independent and manage self-care or bring a care-giver to provide assistance. Price: $175 per staff person, plus 3% USFS Fee. Independent camping is not staffed. Space is limited and on a first-come, first-served basis. Rental equipment is available. Price: Camping is free, but a reservation is required with the NSCD.